By Eric Peters, Managing Director, Faststream U.S. It is official: Salaries for employees in the Maritime and Offshore sector in North America are steadily increasing. Whatever your trade, there’s a chance that employers will be willing to pay more for your services compared to last year, especially if you possess the right amount of experience. Research conducted by the Faststream Recruitment Group’s Fort Lauderdale office, based on data collected from placements in North America over the last two financial years, shows an average rise of 9.7% in salaries across the board. Beyond this, the entire shipping industry is feeling the gap in experience, what many characterize as ‘the lack of successors’ in the industry. For this reason, candidates with 7 to 15 years of industry experience are in the highest demand, but at the same time, they are also the most difficult to find. As a direct result, they are being paid more based on where they are at in their career and what they can offer to a business. In certain sectors, the changes in metrics are particularly pronounced. For example, the demand for Naval Architects and HSEQ professionals in the Maritime and Offshore markets has increased significantly due to the rise in newbuild tonnage, refits and recent ISO/ISM regulation changes. For HSEQ professionals, high demand looks to continue through 2015 and beyond due to the ever-evolving development of pending rulemakings. These include, but are not limited to the U.S. Coast Guard’s pending Subchapter “M” standards for uninspected vessels (such as tug companies). And, the gap in salaries between Naval Architects working in the Maritime industry versus those in the Offshore sectors continues to widen, with the Offshore sector benefiting from professionals who are looking to make a move based purely on money. Separately, Technical Superintendents could potentially earn $15 to $20,000 more per annum if they have 7-15 years’ experience and Vessel Operations specialists could earn an extra $10 to $15,000 annually if they can demonstrate at least 3 to 5 years of experience. At the same time, companies who have balanced out through the economic crunch are now looking to Commercial Sales professionals to start growing their business again. 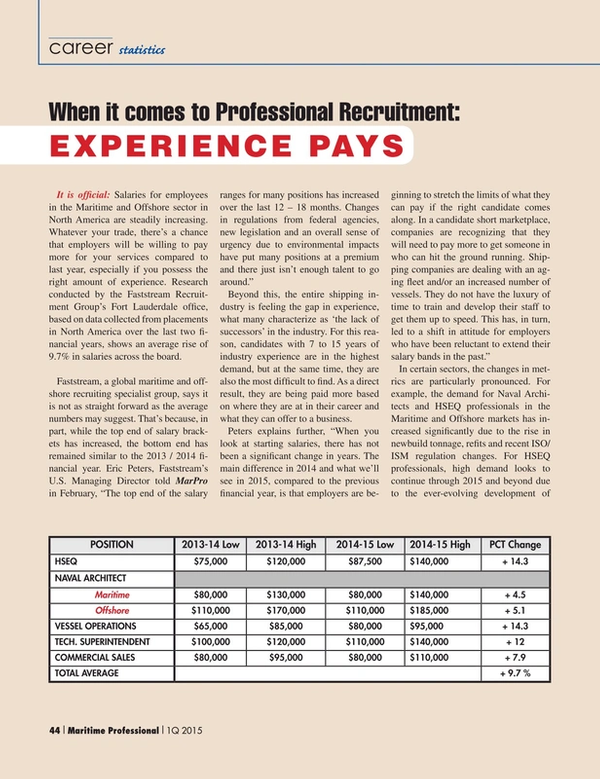 The demand for experienced sales candidates grew into a highly desired skill set in both 2013 and 2014 in anticipation of the continued progression in 2015. With more private equity participation and outside lending groups involved in business relationships in the shipping industry, there is more of a focus to deliver sales and bring “new business” to the table. Owners are looking for candidates with a strong network and relevant relationships. Those that possess these qualities have enjoyed an increase in earnings of as much a 15 percent. “The real story here is supply and demand,” says Peters, continuing, “There are far fewer Maritime graduates going out to sea and those who are going out, are coming ashore much quicker and therefore have less technical experience. The workforce in the Maritime industry is aging and looking to retire or work reduced schedules, while regulations put more responsibility on these individuals and the various tasks they handle. All of this is creating the “perfect storm” in the war for talent in the Maritime industry. An average salary doesn’t really exist anymore, or at least it doesn’t represent the reality for employers and employees. Company size and location will always affect the basic salary, but for the most part salary is representative of the company’s urgency and need for the experienced candidate.” Bottom line: it is still a good time to be in the market for the right job situation, regardless of the price of oil, provided you bring the right skill sets and more importantly, the experience to hit the ground running.